It has been eight years since Upper Noe’s major renovation into a world-class community asset. For the most part, it has held up well. The building is in good shape; the grounds and play spaces are attractive, safe and functional; programs continue to fill up; and more and more people are making use of rental opportunities for public meetings, parties, and sports. There is so much to love about this facility. It is easy to see why it is so popular. Of course, all that love causes wear and tear, and even simple repairs and equipment replacement can take years to happen. July is a new budget cycle and the ideal time to make our needs known. To keep our park the beautiful vibrant community center that it is, we need to act now. That so many of you supported Prop B shows how much San Francisco cares about our parks. Its passage, however, will not necessarily solve our problems. The number of gardeners and maintenance staff on hand at Upper Noe has not followed good and bad budget years. The effort to gain and keep attention on our needs and issues has always been, and will always be, a matter of squeaking loudly and repeatedly. The State of the Park - Looking at the Future for Upper Noe Rec Center will be the topic of discussion at the next Upper Noe Neighbors meeting on July 13 at 7 pm in the auditorium. Join us. Your feedback will help lay out a path for the coming years to ensure that this park not only stays viable but adapts to serve the changing needs of our community. Park Service Area 5 Manager Carol Sionkowski. Recently, we met with Carol and welcomed her to this rewarding and challenging new position for her. We shared our visions for the park and looked to find ways to strengthen support and communication. Carol brings a wealth of knowledge and experience, serving previously as park section supervisor in the Strybing Botanical Gardens. Email her at carol.sionkowski@sfgov.org. Tell her how much you love Upper Noe Recreation Center and how much you use it. Ask her to please, please protect the health and beauty of our park. Call 311 - In general, when something needs attention or maintenance, from garbage to graffiti, broken equipment to peeling paint, call it in to SF Customer Service Center. Dial 311 or 415 -701-2311. The more calls, the more attention an item receives. Requests from park patrons can often carry more weight than from park employees. Reservations - We support the Rec & Park reservations system as an equitable means for families and groups to plan and schedule picnics and events in our parks while ensuring responsibility and commitment. Currently, the plants at Upper Noe are dying from lack of water because the automatic sprinkler system is not running as intended. While Rec & Park has promised to investigate soon, when our plants die off we will find ourselves in a struggle to find resources for new ones, taking even more gardening labor and time, so much time, while the children of Upper Noe grow old. We already lost so many plants and trees. I am asking you to take time now to make some noise, before the situation slips out of reach of rescue. Call 311 (415-753-7092). There can be no greater joy than to see our playground jam-packed with children, as it is every weekend morning. Rec & Park has been wonderfully responsible about safety. The tot swings have been replaced, the wooden equipment has been refinished, and the tall trees are trimmed regularly. Where we are in need is with broken or failing equipment, such as the defunct spica spinning pole whose bearings are shot, the torn up rubber surface, and the giant witches hat that seems in need of new bearings. Friends purchased a sandbox cover several years ago to keep it sanitary. Staff is not on hand on weekends to put the cover in place and keep the cats out. We are asking parents to please pull the cover over the sand if you are there in the late afternoon or early evening. Events at the park are fun. They bring us all together and build community. 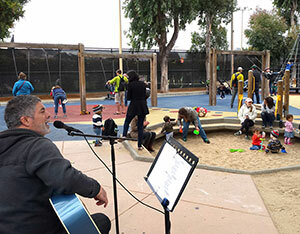 Live music use to be a monthly highlight in the Upper Noe playground. With some help, we might revive the Friends Concert in the Park Series, organize a community block party, dance, festival, you name it. Anyone interested in organizing events and any local talent interested in performing should inquire to info@noevalleyreccenter.com. Until then, Karaoke is happening every Friday evening from 6:30 – 8:30 pm. Drop in. Our beautiful community green, the Upper Noe athletic field, is in constant use. Junior baseball games, tots learning to play soccer, and family outings are continuous. While reduced use over the winter and some reprieve from the drought helped it to recover a bit, bare spots, uneven clumps, clover and dandelions are ubiquitous. We hope to close it next winter so it can receive a full regimen of care and perhaps new sod on the infield. Keeping the park clean and in good repair is vital to health and safety, and to the livability of our neighborhood. Removing litter and graffiti sends a strong message that the community cares. We need to ensure that Rec & Park understands our concerns and allocates resources in a timely manner. Painting and surface repair are two areas that make a good first impression and help define a park as world-class. Such work is on going but several areas stand out. 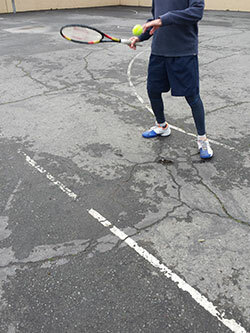 The exterior basketball court and tennis court need resurfacing soon before they need major repair. The interior gym walls and the exterior fences and gates need paint. Please do not assume that someone has notice the same things that you do, or that an item will get painted or repaired in due time. Call 311 (415-753-7092) in addition to reporting to the office. Be the squeaky wheel. Joby’s Run is a heavily used facility that get lots of loving care from neighborhood volunteers. However, it needs much more than we alone can provide. To keep this space pleasant and healthy requires regular maintenance including use of the sprinkler system to settle dust and remove smell. The necessity of this is often not apparent to the casual observer or to Rec & Park employees. In addition, the decomposed granite surface has worn thin. Five years have passed since the last new load of gravel and we need to acquire more soon. Over the past eight years, three of the four shade trees planted during the renovation died. After four years of meetings, requests and constant nagging, Rec & Park finally added 5 very young trees. We were so happy, until two of them died almost immediately, as did the last well-established tree planted near them. So, here we go again, back to Rec & Park and have more brought in. In addition, we would like to purchase more benches for the large number of daily patrons who sit and socialize in our wonderful park. contact: Upper Noe office in person or by phone, 415 970-8061.